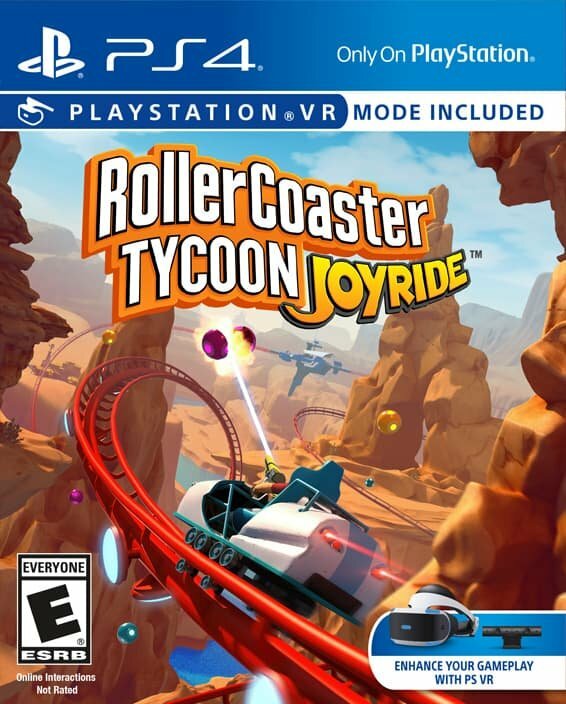 RollerCoaster Tycoon Joyride is one of those games that seemed like a surefire idea in evolving the classic series to the modern era, with the prospect of VR support being the cherry on the cake — It’s with great sadness that I must report that this game barely even qualifies as a simulation title, let alone a title worthy of the RollerCoaster Tycoon moniker. RollerCoaster Tycoon Joyride offers very little in the means of challenge or even things to do, instead, the title gives players a meagre two maps, albeit fairly large ones, in addition to a basic track builder. The only building options players have in the sandbox mode aside from actually building the rails, is the ability to place boosters and targets for players to shoot. If targets seem a little out of place, that’s because they are. 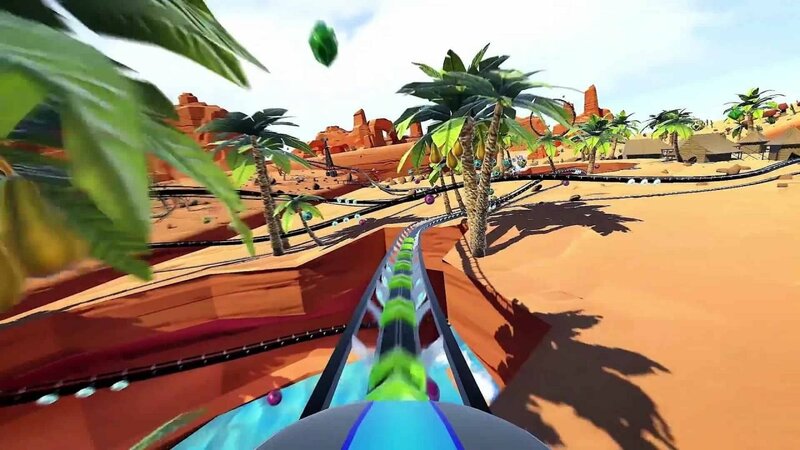 For whatever reason, the developers behind Rollercoaster Tycoon Joyride thought it would be fun to include a literal on-rails shooter feature within the game. As someone who had a ton of fun playing games like Until Dawn: Rush of Blood, at first, I thought the inclusion of a shooting mechanic in a rollercoaster game would spice things up, unfortunately, this aspect of the game fails to deliver even a sliver of fun. Instead of shooting anything remotely interesting, players are left with generic sci-fi, looking bouncing balls that they can take pot-shots at, with their mounted weapons. there are only 3 types of weapons in the game, the Swordfish, Hammerhead and Kraken, none of which are worth unlocking as they only slightly augment the shooting experience of the game. Essentially, the gunplay in Rollercoaster Tycoon Joyride feels akin to a college student’s first attempt at a 3D accelerated game, and if this sounds harsh, readers should keep in mind that Rollercoaster Tycoon Joyride doesn’t even include in-game music while playing the title. This unpolished feeling permeates throughout the game, nothing during my time with the game felt particularly engaging, or even fun. Even playing in VR, I felt a real lack of momentum and speed, this ultimately made the VR mode feel like a wasted effort, rather than a cool extra mode. 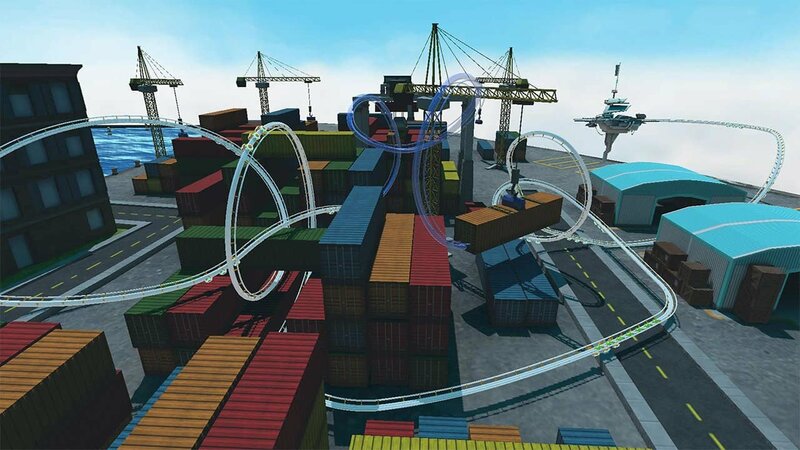 At the end of the day, RollerCoaster Tycoon Joyride is a bad game that uses VR as an excuse to make itself appear like an experience worth taking. Graphically, Joyride is a bland looking game, especially in regards to the city level, which to me, felt like it was on the same graphic-fidelity as something that could be found on the PlayStation 2. The desert oasis level was better, thanks to the inclusion of a vibrant colour palette, but still fell short, in terms of including anything particularly interesting to look at/interact with. I think what pains me the most about RollerCoaster Tycoon Joyride is the lack of content and its tepid-at-best track builder. 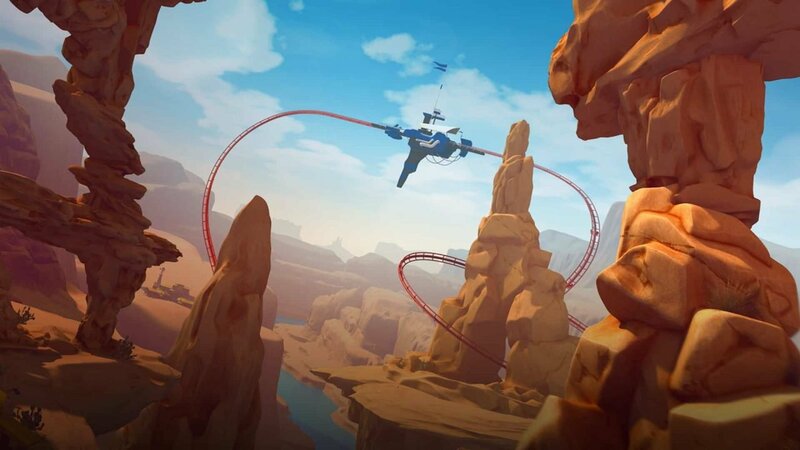 Joyride is a far cry from what made the series popular in the first place, instead, players are left with a mediocre, unfinished mess that should be avoided at all cost.